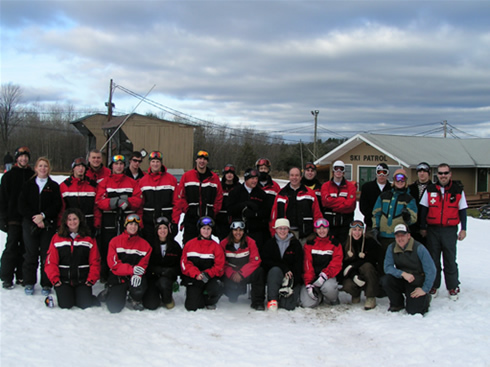 Ski Sawmill has a staff of excellent instructors. We pride ourselves on being a great mountain to “Learn to Ski!” Our beginner lessons will teach you the basics of skiing as well as give you the confidence you need when you come to the slopes. Our more advanced lessons will show you how to take it to the next level in your form and technique enabling you to go anywhere and feel confident of your ability. Our lesson are sold at various times throughout the day unless you purchase a private lesson and then we will do it as long as one of our instructors is free at that time. It’s a good idea to come an hour ahead of your lesson time to make sure that you get your equipment and everything ready prior to your lesson. Weekday lesson line-up times are 1:30pm, 3:30pm, 5;30pm. Weekend lesson line-up times are 9:30am, 11:00am, 1:30pm, 3:30pm, 5:30pm (Not on Sunday). Package includes a 8hr lift ticket (for the designated beginner areas only), 1 hour group lesson, and ski rental. In this lesson you will learn the basics of skiing. Your instructor will teach you how to turn left, right, stop, and how to ride the lift. This lesson is a must do for any begginner taking the slopes for the first time. Must be at least 7 years old to participate in a group lesson. Package includes a 8hr lift ticket (for the designated beginner areas only), 1 hour group lesson, and snowboard rental. In this lesson you will learn the basics of riding. Your instructor will show you how to turn left, right, stop, and how to ride the lift. This lesson is a must do for any begginner taking the slopes for the first time. Must be at least 7 years old to participate in a group lesson. Group lessons are taught by experienced professionals who can really increas your “fun factor.” Skiers and riders are grouped by age and ability as applicable. There are convenient lesson times each day for skiers and riders of all ability levels. Make sure to check the lesson line-up times before purhcasing a lesson ticket. Also, try to puchase your lesson at least 30 minutes before the actual time of the lesson to insure you will make it there in time. *If the lesson has less than 5 students lesson time will be 1 hour. Kids 6 and under are not allowed in group lessons. Snowboard lessons times may vary. Take it to the next level with a private lesson. Our qualified instructors can help you improve your technique and form so you can ski or ride with the best out there. This is a great opportunity to take advantage of their knowledge and expertise of the sport in a one-on-one setting. Are you nervous about your first time skiing or boarding? Check out this video by Wellsboro Home Page to ease your nerves!